Well drained soil that holds moisture well. 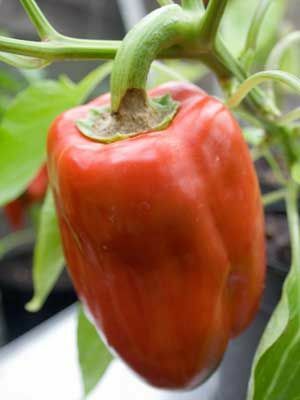 Mix an organic fertilizer into the planting holes as you transplant peppers. Feed every two weeks with a liquid feed after the plants begin to blossom and set fruit. Basil, Marjoram, Oregano, Carrot, Tomato, Borage and Dill. Start indoors, and set out seedlings when the soil is settled and warm. Mulch to keep soil lightly moist at all times. Tie heavy-bearing plants to a single stake to keep them from falling over. Peppers can be harvested when they are still green, though their flavor improves as they ripen to red, yellow, or orange. Hot weather can cause peppers to temporarily stop flowering. They will pick up again when nights cool down.